Prominent & Leading Manufacturer from Nagpur, we offer assembly line conveyor. The conveyors used in the Assembly line of any product are normally Horizontal Conveyors with very low belt speed. 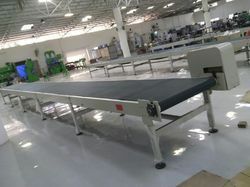 These conveyors are generally tailor-made depending on the application of the product. Bajaj is supplying the Standard and customised Belt conveyors to Material Handling Industry such as those moving boxes along inside a factory such as those used to transport large volumes of resources and materials.Based on the proposed use, conveyor belts are manufactured using either PVC or rubber.